About Achievement: SKSA has always been about Achievement. When we started SKSA it was with the intention of bringing the best training to paddlers in our region. One reason we love this sport is the great diversity of specialization that it offers. We think there is something for everyone in this sport. To be effective at reaching a wide group of paddling interests we feel we need to be competitive at many aspects of the sport. We want to not only experience the diversity we want to excel at it so that we may teach with confidence and ingenuity the wide range of students we hope to reach. We think that this record of achievements demonstrates our dedication to our profession and our love of the sport of paddling. We hope that it demonstrates to you our commitment to the sport and to our students. We challenge you to start your own record of achievements. Please, do not think that you need to do everything we have or in the same way. We hope that you choose your own special portion of the sport and seek to excel your own way. On any given day, the only person you need to be better than is yourself! Come join us! About Racing: is a demanding sport requiring feats of balance, strength, endurance, strategy and perseverance. In the US, racing takes place at the local and regional and national levels sponsored through the ACA (American Canoe Association) USCA (United States Canoe Association) and USACK (USA Canoe and Kayak). Local and regional races may be 3-10 miles (5-16 kilometers). National races are 20 kilometers (12 miles). A typical ICF ICF marathon race is held on a 36 kilometer lap course (~22 miles). Kayak marathon is an astonishingly complex sport requiring the ability to sprint at the start, maintain an 8 mph race pace and put in burst of speed (burns) to pass competitors. Races often have several portages where the racer must jump from the boat, pick it up on the fly and sprint as much as a mile while carrying it and the paddle usually while barefoot. The successful racer must have deep knowledge of tactics, divine the most intense thoughts of others in the race, and be able to wash hang (draft) in packs of as many as 20 boats all with less than a paddle's length apart. Races may be separated into classes depending on type of boat, number and age of paddlers and gender, but often local races	are free-for-all with women and men of all ages competing against each other but typically single person boats (K1, C1) do not compete against multi's (K2, C2, K4...) Generally boats are separated into canoe and kayak classifications. Kayaks may be separated into classes depending on whether they are sea kayaks or ICF (International Canoe Federation) race-boats. Sea Kayaks vary in length and may be further grouped by length ranges for fairer competition. At the world level ICF boats predominate. These boats are built to specific length standards,but current rules allow the width to be as narrow as the paddler can support. A typical ICF kayak is 17 long but may be 14" wide at the waterline and weigh under 20lbs. These boats do not sit upright when placed in the water - it is the job of the paddle to keep them from tipping over. Picture managing this while fighting for position in a pack of 20 boats along a winding course for nearly 3 hours. Simply attempting this will necessitate honing your skills to peak level. Elizabeth O'Connor began her "real" racing career in a sea kayak in November 2000, participating in New Jersey's Delaware and Raritan Canal race where she was the first woman across the finish line. After only this one regional race she entered the USCA National marathon competition at Lake Lanier, GA in 2001 astonishing everyone as she won the title of top woman's sea kayak racer and took third in the ICF class. Participating in many regional races honed her skills, but by the 2002 Nationals other racers had her in their sites. Still she managed to defend her title in the Sea Kayak marathon and took second place in the ICF class in the races at Dartmouth College on the Connecticut River. By now Danny Broadhurst was her coach and they set the ICF World Cup as the long range goal. In the spring of 2003, again at Lake Lanier, GA she handily defeated her only US competition to win a place on the US Team headed for the ICF World Cup in Spain in September. Later, in August at the Nationals she defended her Woman's Sea Kayak Marathon title for the third year in a row and took second in the ICF Woman's Marathon class losing by less than a minute to a Canadian racer. In ICF World Championships in Spain she supported the US-Team as it's top point winner moving America to 16th place world wide from 21st the previous year. Danny Broadhurst has had an illustrious career in competitive kayaking starting in England and progressing to world competition. With maturity comes wisdom. Even though kayak competition maintains a strong masters program in which Danny competes, his current interest is using his knowledge to develop talented world class contenders. He has now coached several women kayakers at USA Nationals and World Championship completion following ICF (International Canoe Federation) regulations. Danny continues to design boats and build paddles in his shop near Mastic, NY. Local Support is a critical resource. No person is an island. The achievements recounted on this page are not those of Elizabeth and Danny alone. There is a strong support group of friends and local paddlers that whether they realize it or not serve to make all this possible. It is not conceivable that training by oneself (although this is often the case) can serve to make a competitive athlete or instructor in this sport. There is too much of a dynamic nature in a kayak race for one to properly prepare	by hard work on one's own. For this reason such activities as our Fun Races while hopefully healthy and rewarding for all are critical for a complete training program. Furthermore, the endeavors that are tackled in the form of local, regional, national and international competition, not to mention the simple day-to-day activities of classes, clinics and tours would not be possible or as desirable without the participation and enthusiasm of all the friends and acquaintances that congregate around SKSA. It is with this in mind that we have been laying the groundwork for a local club that will train together and eventually learn to paddle together in the spirit of similar clubs in Europe. Finally it is important to note the critical support of friends and family in buoying the spirits of any success. In the lonely hours of training and also in the dire moments of playing catch-up in a marathon it is these factors that help fortify the perseverance and grit that carry one through the toughest of times. Without the camaraderie, support and challenge of ones friends and peers this would be a lonely sport indeed. Incorporation of SKSA-Ltd: was the culmination of five years of intense devotion to sea kayaking. Elizabeth began this sport as an outlet for stress during a troubled period in her life. During this time she worked closely with the Nissequoge Canoe and Kayak Club (now Long Island Paddlers ) and grew into the sport with many of their serious paddlers. Partly because of her innate drive to excel and partly because of the wonderful escape that really throwing yourself into the sport provides she developed her skills far beyond the casual paddler. After five years of personal growth she wanted to give back something to the sport that had given her so much. Not wishing to offer anything but the best instruction she prepared herself at great expense with advanced level ACA guide-level training and BCU Level-2 coach training and even arranged for an internship with a top rated Maine guide company before opening business. Continuing to advance her skills, she is now a certified instructor-trainer for the ACA and the American Red Cross. Elizabeth noted quite clearly that the knowledge of paddling skills and kayak safety was generally poorer on Long Island than in other parts of the country. Perhaps this is because of the social make-up of the island, perhaps because of the rich coastal resources much of which offers the perception of safety if not the actual fact. Regardless, there is a growing population of paddlers with easy access to equipment and put-ins which can greatly benefit from safety and skills training. Racing is a natural progression of Elizabeth's drive personal growth in the sport, but her original goal remains the same: to provide a resource of qualified training for the beginning kayaker, and to reach as many novices as possible with this beneficial information. Testifying to her commitment, where others on the island principally offer instruction on a part-time or hobby basis, for Elizabeth it his her primary business and sole source of income. The First Kayak Race of Elizabeth's career was a small race sponsored at Matituck by Matt-a-mar Marina. Surprisingly she won not only her class but also beat the male contestants. It also won her the notice of Danny Broadhurst who was racing K-2 in the same race. At this time Danny was working with another woman, coaching her for the USCA Nationals and the ICF World Championships. A few months later it was agreed that Danny would also take on Elizabeth and she began to set her sites on higher levels of competition. USCA National Races: the 2001 races at Lake Lanier in Gainesville, GA was Elizabeth's first National level competition. She had been training for only four months in her new ICF race boat (a Kirton Joker) and had barely learned to "sit" the boat. Still, she managed to take third place in the women's ICF class (20 km). She also paddled her Surge kayak to her first national win in the women's Sea Kayak class (20km). As a prize, when she finished the race, she discovered Danny had sold her ICF race-boat, deciding it was "too stable" (read: 'not	fast enough') for her skill potential. The joker has a rating of about "6" for stability. Her next boat, a Kirton: Tecnik has a stability of "2". Fall Regional Races sponsored in Connecticut, Massachusetts, Pennsylvania and New Jersey by NECRA, P.C.C. and several charitable organizations offer interesting and varied competition within reasonable travel distance. Usually they can be reached by an early riser on the day of the race, but some like the D&R Canal Race and the The Run of the Charles deserve an extra day to scout portages and develop strategy. Elizabeth, Danny and friends usually compete in these races especially in the fall of the year as gear and training commitments taper off. 2001 was the first year for Elizabeth to attend the full circuit and was proud of her placement usually beating all of the women and seriously challenging the men. The Running of the Charles (ROTC) race on the Charles River in Boston, Massachusetts is an annual event with huge attendance. Danny and Elizabeth planned to use this late-April race as a combination training and touchstone for their preparedness for the Long Island Circumnavigation scheduled to begin three weeks later. Elizabeth in the 9-mile course creamed everyone (male and female) by over 2 minutes. Danny cruised well in the 6 miler and was 8th over-all, and 5th in the Masters 50+ in a very satisfactory 55 minutes. Both hated not being allowed to use wing paddles. It was funny as ages were spent getting readjusted to conventional paddles just for that day! It was a good weekend of racing and the other Long Islanders who came up did well and enjoyed the experience of racing in freezing, rainy conditions. The Long Island Circumnavigation is a superlative challenge for even the most serious paddler. When Danny Broadhurst and Elizabeth were approached by the Long Island Alzheimer's Fund it gave them pause because of magnitude of the project. Danny was still recovering from a heart attack the previous year and both needed to give serious thought to training for such an arduous trip. Months of preparation and organization of support saw them embarking on May 15, 2002 from Port Jefferson to travel counterclockwise around Long Island. The planning was all important, but could not take into account the vagaries of the weather as dangerous storms and unexpected headwinds obstructed them over most of the journey. Their boat a "Njord" provided by Kirton Kayaks performed well and the help of able assistance from a dedicated land support team of friends and family they were able to complete 176 miles in 7 days. In all, the planners calculated 165,000 paddle strokes to finish the course and hoped to raise $1 per stroke from L.I.A.F. contributors. Kayak class: By this point Elizabeth had achieved her ACA Open Water Coastal Instructor (L4) certification. She was teaching the Intro to Kayaking class at St. Joseph College (now defunct) in the early summer with the help of her friend and fellow paddler, Dan Troup. One student, a recent immigrant from Connecticut, Gordon Dayton was a participant along with Linda Buffa. Both students would figure importantly in subsequent years with SKSA. Both continued to take classes and both took up kayak racing developing friendships with Elizabeth. Gordon went on to become an ACA Open Water Coastal Instructor, SKSA Webmaster and eventually... well read the blog. USCA National Races: The 2002 race was held on the Connecticut River at New Hampshire's Dartmouth College in mid-August. Dartmouth has a strong sculling program and excellent facilities and the weather provided a beautifully sunny weekend. Elizabeth was racing two new boats: a Kirton: "Teknic" in the ICF class and a Kirton: "Inuk" in the sea kayak class. She was still getting used to both boats, especially the Teknic which as an extremely low stability rating and demands a highly experienced paddler to hold it up, much less make it perform. Never-the-less, with sites set on next year's ICF World Championships, it was the boat of choice to develop skills. Elizabeth was able to overcome adversity taking second place in the ICF class. And, after a frustrating debate over width rules, she again defended her title of National Champion in the Women's Sea Kayak division. Both races were the USCA standard marathon distance of 20-km. Fall Regional Races: the Northeast Canoe and Kayak Racing Association (NECKRA) races in 2002 were a joy to attend as now a strong following from Long Island was making an impact. Elizabeth and Danny had been organizing and encouraging a small group of competitive local paddlers to help with in-race training in preparation for the world championships. Most US athletes are at a serious disadvantage since Europeans typically train in race clubs. This fall saw a marked increase in participation from Long Islanders which is gratifying and encouraging. In all, five races were attended in Massachusetts, Connecticut, Pennsylvania and New Jersey and all participants made good showings. Cudos to all!!! The USACK Team:Working to qualify for the 2003 ICF World Championships required progressively more intense training over a two-year period. All aspects	of the athletes life becomes more critical as such a challenge is faced. Cross training with weight and running for strength and endurance; stroke training for starts, sprints, race-pace, and "burns", as well as "perfects" to optimize efficiency; even such mundane aspects as nutrition and sleep are carefully regulated to meet the demands of various aspects of the program. Serious training started in 2002 and continued through the winter with a hiatus only when the rivers and bays were completely iced over. Many a day saw Danny and Elizabeth climbing snowbanks with raceboats to make a training run. It paid off because at Lake Lanier in Gainesville, GA on May 17th Elizabeth trialed and qualified for the U.S.A. Canoe and Kayak (USACK) Team headed to the ICF World Championships in Valladolid, Spain later in September. To make the team she had to finish the 30 km course with a time within 10% of the Senior men which she did. Her closest US competition finished a full 2 minutes behind her. Next stop Spain by way of the USCA National Competition in August. D.A.M. Fun Raceswere organized for the first time this year. Eight races, one per month, from April to November. We found there are several serious competitors on the Island. Others in nearby states are beginning to take notice and our finding their way to the DAM races. The races, though fun in nature to encourage all to participate, were professionally organized and timed so all could gauge their improving skills. Indeed, we witnessed a systematic progression of improving times with only minor changes in standing as everyone got better and better. These really are fun races and there is no better way to learn what works best for you than to see what it takes to overtake the person you have been following race after race! Tuesdays at the Lake was a pipe dream at first, hoping to get some participation in repeat training, but Danny and Elizabeth were gratified to see five to seven paddlers show up regularly throughout the summer. Basically this is just personal stroke and endurance training with no critique. Paddlers may do solo circuits or work in pairs, but the hoped for wash-hanging groups never formed as people arrived at different times. We were able to get a pack together for dinners afterwards and most nights saw great attendance as significant others drifted in for this most serious part of the training! USCA National Races: The 2003 races were held in Warren, PA on the Allegheny River. Elizabeth and nine other Long Island paddlers participated in the event, the best Long Island showing to date. On Saturday, Elizabeth was the first American to cross the finish line in the ICF Women's division but took second to Dawn Williams of Paisley, Ontario, Canada by 56 seconds. Under different circumstances this could have been a very interesting finish as Elizabeth and Dawn were neck-and-neck through most of the race until Elizabeth had to stop to fix a rudder that was damaged on a submerged rock. The next day Elizabeth went on to defend her title of National Champion in the Sea Kayak Marathon. The women started 10 minutes behind the men. Elizabeth led the women throughout the race and proceeded to overtake 5 of the men in the preceding pack finishing the 20-km course in 1 hr. 43 min. One of Elizabeth's and Danny's students, Linda Buffa, took third at 1 hr. 51 min, just two minutes behind Pam Browning of Massachusetts. All in all a very good year for Long Islanders and for women kayak racers at the USCA Nationals. 2003 ICF World Championships: Having qualified for the US Team, Elizabeth spent another season training for this event. The results were extraordinary considering the circumstances. Elizabeth got off to a rocky start, but maintained a strong pace throughout the race. Her lap times were consistent with or better than her training times here in the states. Of the 22 participants in the women's marathon, many had health issues and two badly damaged their boats on the floating docks at the portages making this a difficult race all round. Elizabeth persevered and finished 11th with a time of 3:47:40:43. If she had not had problems at the start she feels her time would have been 10-15 minutes faster, but this would not have changed her standing or point contribution to the US Team. The ICF World Championships is the Olympic level event for kayak marathon. Only the strongest athletes from each country can qualify and attend. Most countries participating are very serious and have much stronger programs with training starting in youth clubs. Elizabeth brought the US across the finish line as the 8th country in. She was 26 minutes ahead of the other US Team member, and so contributed 13 points to the US team standing for the Championships. This was the highest point contribution of any of the 12 US team members this year, including the men. The US did well this year. The final standing was 16th in the World overall a significant improvement over last years standing of 21st. All team members gave their best, but perseverance and luck allowed Elizabeth to make an especially strong contribution - Bravo Elizabeth! Elizabeth's achievements at the ICF World Championships were the product of a large group of people who helped her train and contributed financial support to get her to Spain. These unsung heroes are just as important as the champion who competes: Special thanks to all our World Championship supporters! Fall Regional Races: the Northeast Canoe and Kayak Racing Association (NECKRA) races in 2003 were therapeutic and rejuvenating after the completion of such an immense program as preparing for the World Championships. Elizabeth could finally relax and enjoy these local races purely for the sport of friendly competition and healthy exercise. The Long Island regulars were in attendance with a couple new faces. All participants made marked improvement over their previous years times, some now beginning to challenge the regulars. It is beginning to look like Long Island is putting together a serious racing club! LI Paddlesport Safety Symposium was launched for the first time this year. This free symposium was designed to familiarize the public with paddling skills and safety information. It was organized by SKSA-Ltd. with support from the United States Coast Guard and Suffolk County Community College and sponsorship from Eastern Mountain Sports, The Great South Bay Power Squadron and the Coast Guard Auxiliary. Active participants included Long Island Kayak Racing Register Long Island Paddlers and other Long Island paddling groups. A great success! Formation of LIKRR: The Long Island Kayak Racing Register (LIKRR) had been in the works for nearly two years. 2004 saw the official launch of this race club and the formalization of membership. With Danny Broadhurst as coach and Elizabeth as lead paddler the team of local racers has already been functioning through the past two race seasons. Current goals are to launch the website that has been in preparation, build membership and register the organization with local racing bodies. USCA National Races: The 2004 races were held in Oscoda, Michigan. Eight paddlers from Long Island registered and of those six were LIKRR members. Elizabeth again defended her title, winning the sea kayak marathon: women's division, and took second place in Open ICF class. LI Paddlesport Symposium II: saw its second year and moved to a new home at Connetquot High School. We succeeded in expanding our participation to other groups on long Island. Again we think our key supporters: the United States Coast Guard, the New York Office of Small Boat Safety, the NYS Department of Parks, Recreation and Historic Preservation, the Great South Bay Power Squadron and Eastern Mountain Sports. Empire State Games team for Long Island asked Elizabeth to join this year. Elizabeth has never been a competitor in the short distance sprint kayak events featured in these games. It was with some interest that she trained for this competition. She attended the trials and became a strong component of the women's team in multiple events. This year she took three silver medals in 500 meter singles, 500 meter doubles and 500 meter K-4, respectively. Elizabeth is proud to have taken the gold for Long Island in the 200 meter doubles along with Linda Buffa from Kings Park. This showing made her one of the top 4 paddlers in this years games. North Atlantic Canoe and Kayak (NACK) was founded this year as a paddling club dedicated to the highest ideals of training, safety, adventure and fellowship. The intention is to model the club on the active and cohesive clubs of Britain with their structure of skills certification and in-house training, but as a Paddle America Club under the auspices of our own American Canoe Association. Elizabeth O'Connor accepted a position on the Board of Directors along with other local instructors and was instrumental in building the educational and assessment principles for the club. USCA National Races: 2005 was a special year for Elizabeth. She defended her title as National Sea Kayak Marathon champion for the fifth year in a row a special goal that she had been intent on achieving. To all our surprise she was also able to win the ICF Marathon trophy on the same weekend, a truly amazing performance! This double achievement fulfilled two long held goals and marked a transition in Elizabeth's kayak racing career. From this point forward her personal development, always broad within the sport, takes on a more expansive perspective. ACA Atlantic Division: of the American Canoe Association, which manages the ACA Camp on Lake Sebago in Harriman State Park asks Elizabeth to take the post of training Director. In recognition of her work as an ACA Open Water Instructor and her demonstrated organizational skills in Long Island Paddlesport Symposium she is chosen as the strongest candidate in the region to fill this important role. LI Paddlesport Symposium III: continued to build on the success of prior years. It is growing in its content and is now taking more than three months of intensive organization to put together. The symposium continues to build a following this year. It is also beginning to achieve recognition outside of Long Island. The original core of supporters continues to propel this year's meeting. Again, many thanks to all who give of their time to this opportunity to bring education of basic safety to the public on the platform of propounding the diverse aspects for appreciating the sport. ACA-AT Divisional Instructional Facilitator: The Atlantic Division of the American Canoe Association names Elizabeth O'Connor as Divisional Instructional Facilitator. Elizabeth begins coordinating Instructor Development Workshops (IDW), Instructor Certification Exams (ICE) and Instructor Updates for Southern New York and Northern New Jersey. She also represents the Atlantic Division Atlantic at ACA Safety Education and Instruction Council (SEIC) meetings twice per year. SEIC Clubs Liaison: recognizing the need for better representation of clubs needs at higher levels of ACA and building on experience forming the NACK club, Gordon Dayton (SKSA Associate Instructor & Webmaster) negotiates an appointment to the SEIC as "Clubs Liaison". ACA-SEIC Membership: The Safety, Education and Instruction Council of the ACA invites Elizabeth to join their ranks as representative of the Atlantic Division. This body is responsible for coordinating curriculum development throughout the various disciplines of canoeing, kayaking and rafting within the United States. Empire State Games: The 2006 Games saw Elizabeth O'Connor again as a strong competitor in sprint. She achieved 3 silver medals in 500 meter K-1, K-2 and K-4. She also took two silvers in 200 meter K-1 and K-2. She was the strongest member of the Long Island team and one of the four top medalist in the kayak competition. Kayak for a Cause (KFAC) chooses SKSA as the organization to provide training for 125 paddlers working to raise over $65,000 for charity by crossing Long Island Sound. Elizabeth fielded a group of 14 Instructors and Aides to complete basic training for this group in a single day. Skills sessions saw groups of 50 students on the water at one time while the remaining participants attended shore-based classes. L.L. Bean donated over 50 sea kayaks for this training event, later to be used in the charity crossing. North Atlantic Canoe and Kayak (NACK) appoints Elizabeth O'Connor as its Training Chair. She takes on responsibility for development of the clubs Training, Assessment and Certification program. This year the club achieves a 60% ratio of Assessed and Certified members. In November, she joins club President, Gordon Dayton in accepting ACA's Stroke of Achievement Award for program development on behalf of NACK. LI Paddlesport Symposium IV: made it's strongest showing yet. Speakers from as far away as Maryland came to join in three concurrent sessions. Local clubs (NACK and Sebago) worked together to put on the in-water demonstrations. Over 300 participants registered for the event and local paddling enterprises donated over $1000 in support. Elizabeth again wishes to thank the same strong cadre of supporters for lending support and substance to this important, free training event. ACA L3 Skills Assessor: The American Canoe Association confers on Elizabeth O'Connor one of it's first certifications for ACA Skills Assessor in Level-3 skills. She is also awarded certification to provide training and testing for the ACA Trip Leader program. This year she continues to work with several ACA Instructor Trainer Educators on development of her Instructor Trainer certification. ACA Board Member:After a failed prior attempt to gain election to the ACA Board of Directors, Gordon is re-nominated and elected to his first 2-year term on the ACA Board (starting Jan-2008) in order to better represent clubs needs to the National organization. He continues to maintain his position of Clubs Liaison with the SEIC. LI Paddlesport Symposium V: continued to grow as attendees grew to understand and plan for this annual event. Speakers joined us from Manhattan and Pennsylvania and we had support from senior paddlers from the American Canoe Association. As usual several local paddling clubs sent teams to put on demonstrations of kayak rescue and native rolling. We were honored when the NY State Office of Boating Safety awarded Elizabeth O'Connor, symposium organizer a special recognition for five years of service to the Long Island paddling community. ACA Joe Pina Award:Elizabeth O'Connor, President of SKSA and for the past five years, organizer of the Long Island Paddlesport Safety Symposium was awarded ACA's Joe Pina award. This award is presented annually to one or more volunteers each year for extraordinary service. The award was present by the ACA Board of Directors at the annual Membership meeting in November. ACA Recreation Committee: Gordon Dayton takes on leadership of the ACA Board of Directors Recreation Committee as prior chair, Larry Ausley steps into the position of Board Secretary. Historically this body has worked to bring new ideas to the Association through the instrument of the BOD. LI Paddlesport Symposium VI: This was the final year of organizing the Long Island Paddlesport Safety Symposium for Elizabeth. The turnout was one of the best ever for this annual event. Elizabeth encouraged others to take over organization of this worthwhile and much loved event, as we began to plan for the transition to Connecticut shores. NACK Life Memberships:Elizabeth O'Connor, President of SKSA and Gordon Dayton both received honorary life memberships from North Atlantic Canoe and Kayak, the club which they were instrumental in founding with three other Long Island Instructors. The early membership was strongly taken from SKSA student body all of which were strong, well trained paddlers. NACK continues to grow as a club dedicated to training, personal development and service to the paddling community. Marriage of Gordon and Elizabeth: Elizabeth and Gordon finally found time to devote to their personal relationship. In March, on the vernal equinox they were married on the Mississippi River, by the captain of the steamboat Natchez. This event was overseen by Elizabeth's father, Tom O'Connor and Gordon's PhD thesis advisor, Dr. James V. Biggers, two key people in both their personal lives. They honeymooned in the historic French Quarter of New Orleans. Move to Connecticut:Gordon's day-job in electronics R&D took him to a promotion position in Connecticut in the fall of 2008. Elizabeth and Gordon began the search for place in CT to call home and house all their many boats, which took until 2010. Work also began to develop a division of Sea Kayaking Skills and Adventures in the state of Connecticut. 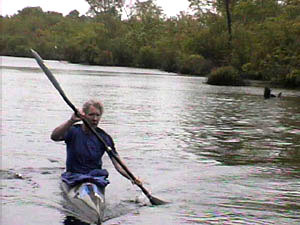 This eventually grew into a new company: Changing Tides PaddleCraft, LLC, officially based in Connecticut as of 2010. SKSA continues to maintain its historic position and clientele on Long Island, but commercial operations are now mainly through CTPC for all locations. NACK Senior Advisor:Gordon continues to maintain a close relationship with NACK and troubleshoot issues between the club and the ACA. While unable to make meetings he still maintains a strong relationship with club officers. Gordon is given the title of Senor Advisor by Board Chair, John Weickert.